Recently, Ted Howard, of Howard's Upholstery, 17225 Akin Blacktop, Benton was named one of Upholstery Journal's "Upholsterers of the Year." He was one of 3 upholsterers chosen from the 10 state Midwestern Region. Howard's name was submitted by his long time friend and upholsterer peer Cheryl Valleroy, of Cheryl's Custom Upholstery, Benton. Howard was cited for his 30 years of experience and expertise at rebuilding older upholstered furniture as well as his abilities to build custom, new, high quality upholstered furniture. "New mass produced furniture is not built like the older furniture that some of us grew up with and was handed down from generation to generation" according to Howard. "If a person still has some of the older stuff, they should really try and hang on to it. A good upholsterer can completely restore it. If not, we have the ability to build high quality new furniture that will last for generations to come." Valleroy, who has over 28 yrs in the trade, was also recently recognized for her talents in the 2005 Soft Furnishings Calendar Contest, where her work placed 1st in the Antique Furniture category and 2nd in the Automotive category. She also placed twice in Upholstery Journal's Design & Craftsmanship Contest in 2000. "This is a unique trade combining art, science, technology and business", Valleroy said. "Every day the technology changes and we must change with it. From the myriads of foam load/densities to the latest rage in microfibers, it's important to stay on top of current information, and yet retain the knowledge and skills to work with traditional fills. Furniture is built totally different today than it was 100, 50 , or even 20 years ago. Techniques that worked with Old World methods will not suffice for contemporary materials, so one is constantly studying and learning." Upholstery has also diversified into sub-specialties. In years past, the local upholsterer was a jack -of-all-trades, sewing up and covering anything that came through the door. But just as other trades have specialized, so have many shops. Some are strictly marine oriented, others will do automotive only. Specializing helps increase the bottom line. 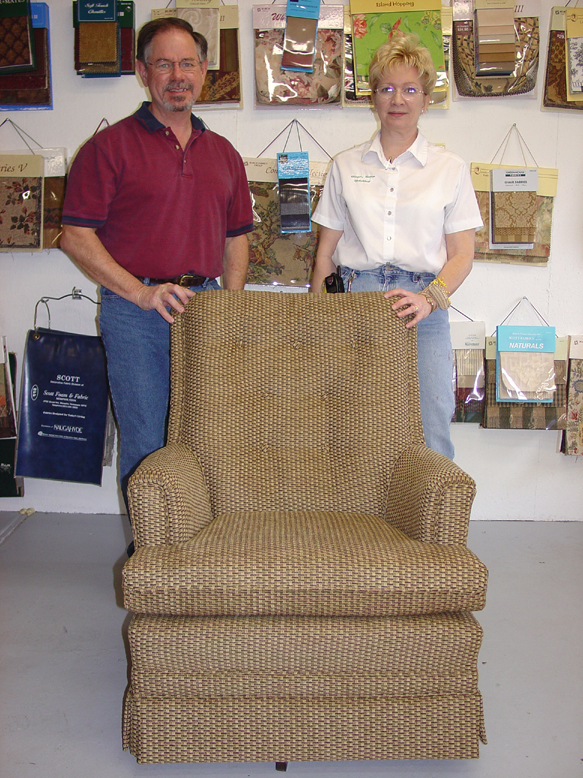 The upholsterer is able to focus on one area, improve and truly excel in that chosen field. Howard exemplifies this and limits his work to residential & commercial furniture as well as church upholstery. While Valleroy still adds the occasional marine or automotive job to her mix of antique and contemporary furniture pieces. She is noted for her exceptional work with leather, stripes and plaids. Now days the two local upholsterers often work together, finding that networking has definitive advantages over the traditional "island mentality" of years past. Howard and Valleroy agree that sharing ideas, experiences and opinions with other pros is a great learning tool. "We both learn and our customers benefit". Howard went on to say, "Last year, St. Marks Church of West Frankfort, contacted me about upholstering their church pews. But due to time constraints, one person could not have finished in time and the job would have been lost, but by teaming up, it was completed in time for Easter services, making my customer very happy. "Since then, they have collaborated on several large church and commercial jobs. Examples, pictures and more can be found at www.cherylscustomupholstery.com (618-438-7541) and http://howardsupholstery.blogspot.com (618-439-7170) respectively.